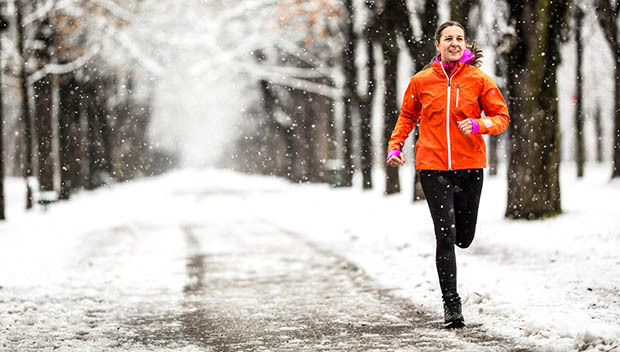 Invest in some key pieces—a running jacket, water resistant gloves, a warm hat and a decent pair of running tights. Bonus points if they're reflective! There's a ton of great stuff on the market these days, and the right gear will make your miles so much more comfortable. It's also good practice dressing for running as though it's a bit warmer than it actually is. For example, if it's 32 degrees, dress as you would for an easy walk on a 50-degree day. It may not seem like it at first, but your body will warm up as you exercise. Start your run against the wind. Wind is one of the toughest things about winter running; it can chill you to the core and make the temperature feel much lower. Check out the weather report and then start an out-and-back run facing into the wind. When you turn around (and are sweaty) the wind will be at your back, and the second half will feel much easier. Break a sweat before you begin. Warm up by doing some dynamic stretches (try lunges or burpees), a few jumping jacks or running a couple flights of stairs. If your body is already warm, heading out into the cold won't feel quite as bad. If you really need a boost, toss your running gear into a warm dryer for a few minutes. Join a local running club or recruit a friend to train with you during winter's dark, cold days. It's always going to be tough to get out of a warm bed in the morning, but if you know you have someone waiting for you, it'll be harder to bail. No running buddies in the neighborhood? Try joining an online running community or DMing with your favorite Instagram runners to build some accountability. Adjust your running schedule if possible. Running around noon will allow you to enjoy the day's warmest temperatures and avoid darkness. Try aligning your training schedule to include long runs on days off from work so you can head out midday instead of early morning or evening. Have a post-run action plan. There's nothing worse than finishing a run and then sitting in cold sweat on your drive (or subway ride) back home. To keep your body temperature from dropping too rapidly, change into warm, dry clothes as soon as possible. If you won't be able to shower for a while, throw on a dry hat and sweatshirt or at the very least treat yourself to a hot beverage. If conditions are bad, head inside to a treadmill or indoor track. Wondering where to find inside options? Check out your local college campus to see if they allow community members to use the facilities. Even if you prefer logging miles outside, an occasional run on the treadmill or track can be a nice break. Queue up your favorite podcast, audio book or playlist to help pass the time. Overwhelmed by a super long run indoors? Break it up in chunks—if you're at the gym, try running five miles on three separate treadmills. Or if the weather isn't too bad, try doing half of your run outside, then strip down to shorts and finish up inside.